In his short career, 15-year-old Josh Hutcherson has worked with many of Hollywood’s finest actors and directors. Opening July 11th, 2008, Josh will be seen in the first high definition 3-D live performance feature film ever, Walden Media and New Line Cinema’s “Journey to the Center of the Earth 3-D,” starring opposite Brendan Fraser. Directed by Eric Brevig, the film follows a scientist (Fraser) and his troubled nephew (Hutcherson) on an expedition to Iceland where they stumble upon a mystery that leads them on a thrill-ride adventure to the center of the earth where they become face to face with never-before-seen worlds and creatures. 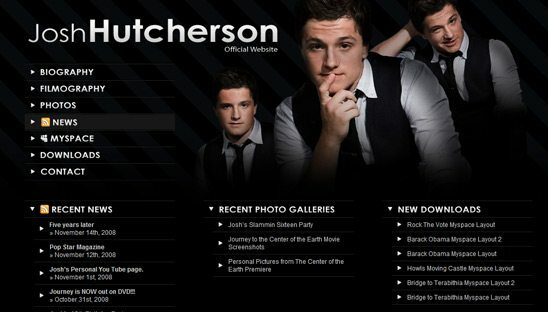 This site was created for all of the Josh Hutcherson Fans. This website was so perfect to create using wordpress. We made categories for Josh’s filmography, news, events and even created a download section, where all his fans can downloads games and different free myspace layouts of all his movies.